Diamonds are beautiful and have long captured the passions of civilizations around the world. The Zadok family has dedicated seven generations to the art of fine jewelry that begins with the diamond. A diamond is simultaneously simple and complex. Both universal and personal. The diamond is the beating heart of everything we do. Zadok Master Jewelers has curated one of the most complete selections of diamonds and gemstones in the country. Our custom designed jewelry allows our customers to find the perfect setting for the diamond that speaks to them. Nothing is as eternal as a perfectly-cut diamond. Diamonds interact with white light better than any other gemstone, giving it fire and brilliance that dazzles the eye and provokes the heart. The rarity of high-quality diamonds helps them retain their value and even after years of being worn and enjoyed, a diamond and can be passed from generation to generation. Diamonds mark the milestones of your life – tangible moments of your history. As heirlooms, diamonds are a legacy to pass down to your loved ones. The Zadok family has been around diamonds for almost 40 years, but we understand that not everyone is comfortable purchasing a diamond. Purchasing a diamond is an important moment in your life and we want to make sure you’re confident in that decision today, tomorrow and every day after that. That’s why we’ve put together a quick diamond buying guide that will help walk you through all you’ll need to know before you buy. 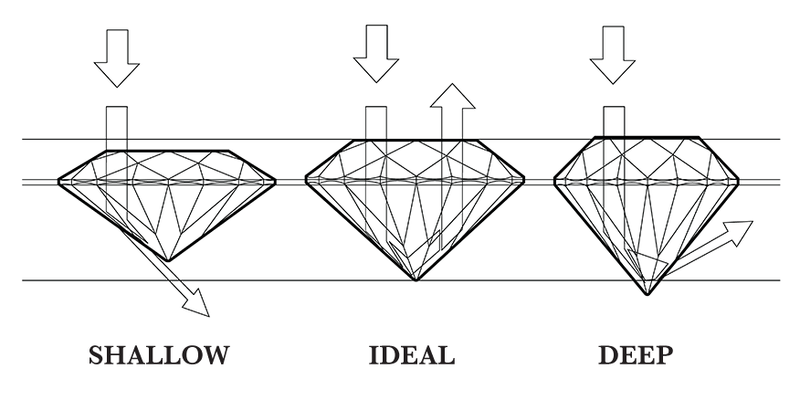 The Four Cs are the key characteristics of diamonds: Carat, Clarity, Color and Cut. On this page, you’ll read more about each of these characteristics. With our expert advice, you will have the education and confidence you need to make this important decision. Naturally occurring, every diamond is as unique as your fingerprint. In 1953, the Gemological Institute of America (most commonly referred to as the GIA) instituted a diamond grading system based on the 4 C’s, which is now the international standard for assessing a diamond’s quality. Each of the 4 C’s – carat, clarity, color and cut – has their own scale, allowing jewelers (and consumers) a very precise way to assess diamond value. This standard is accepted by virtually every professional jeweler and used by every knowledgeable diamond buyer in the world. This shared vocabulary and grading system regulates an industry to work for both diamond sellers and consumers. Carat is the first of the C’s and the easiest to assess. Diamonds, and other gemstones, are weighed in metric carats, which is equal to 0.2 grams. Because the precise size of a diamond is important to its value, the GIA scale breaks each carat into smaller units. Each carat is comprised of 100 points. When you’re shopping for a diamond at Zadok Jewelers, you may here a diamond referred to as a 150-point diamond, which would be 1.5 carats, or .3 grams. Knowing the terminology can help your jeweler find you the perfect fit. The image below is a visual illustration of the carat scale. The next characteristic is a diamond’s clarity. Diamonds are formed deep within the earth under extreme heat and pressure over thousands of years. This intense process is specific to each diamond and causes unique birthmarks, either internam (inclusions) or externam (blemishes). Clarity is the measure of how these birthmarks impact your diamond. Diamond clarity refers to the absence of these inclusions. Diamonds without inclusions are rare, which is why flawless diamonds are more valuable than a diamond with visible inclusions. Below is a visual representation of each level of clarity, followed by a description of each, as defined by the GIA. The most widely used diamond color grading system is the one developed by GIA, which classifies the color of a diamond with alphabetical letters ranging from D (colorless) to Z+ (a diamond with a light yellow or brownish shade). Just as flawless stones are remarkably rare, as are truly colorless diamonds. While many of these color distinctions are very subtle and are nearly invisible to the untrained eye, they play a big role in grading a diamond’s quality and price. For example, most customers won’t be able to see the difference between a D and F rating (both fall within the colorless category), but that same distinction may change the price of a diamond anywhere from 10-20 percent. The GIA color grading scale above applies only to white diamonds. See below for a few examples of each color category. Relative to its long history, only in modern times have cutters been able to successfully harness a diamond’s potential beauty. Today, a diamond’s cut is an essential factor in determining its value. The cut of a diamond is the defining characteristic that fuels a diamond’s fire, sparkle and brilliance. If the diamond cut too deep or too shallow, it will not reflect light or brilliance that we associate with a diamond’s beauty. 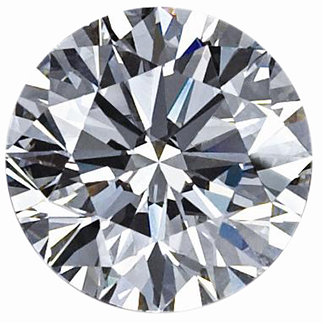 In 2004, the GIA unveiled a diamond cut grading system for standard round brilliants in the D-to-Z color range. This system is the result of extensive research and testing, assigns an overall diamond cut grade as one of the following: Excellent, Very Good, Good, Fair, Poor. 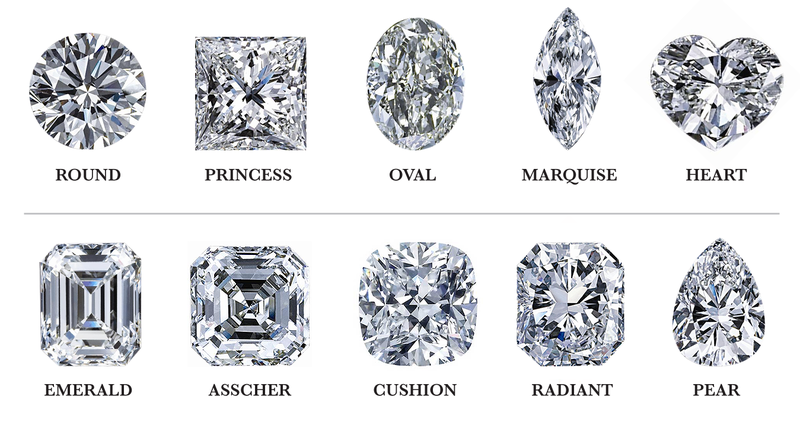 The diamond shape you choose is a matter of personal preference. At Zadok Jewelers, we carry many different shapes and sizes of stones and we will work with you to find the perfect diamond. Your consultant will provide you with additional information to help you better decide which shape is best for you. See below for examples of some basic diamond cuts. Zadok Jewelers offers and prefers the best GIA Certified Diamonds. The graduate gemologists on our staff combine their education and experience to present diamonds that meet the criteria of our valued customers. We only select the best of the best. Staffed by expert diamond graders and gemologists, GIA laboratories set the standard for grading practices used worldwide. Known for its strict impartially and benchmark grading services, GIA is entrusted with grading and identifying more gems than any other lab, including some of the world’s most famous diamonds. A GIA certificate thoroughly describes the quality of a diamond, but it does not place a monetary value on the gem. At Zadok, you will always receive a complimentary appraisal with your purchase that will provide an approximate value of the diamond. This appraisal certificate can be used for most insurance policies if you decide to insure your purchase. Not all certificates are created equally. When insuring your purchase, a GIA certificate is highly respected by insurance companies. 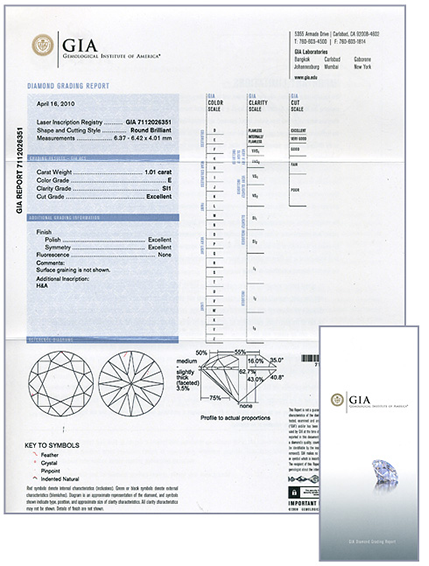 The GIA has an outstanding reputation for keeping the strictest diamond standards. Protect your investment and ensure your diamond is GIA certified.